It's a quick look, but we see lots of details. These days we have more questions than answer about Chevrolet’s new mid-engined Corvette. One thing we do know, however, is that testing continues in Michigan. A gentleman named Chuck Jackson recently posted a video on Twitter of a prototype headed towards GM’s sprawling proving grounds located in Milford, a smallish Detroit suburb located roughly 40 miles northwest of the Motor City. We caught the news at CorvetteBlogger.com. Jackson is listed as the assignment editor for Local4News in Detroit so we suspect he has a keen eye for catching prototypes. That shows in the video, as not only did he get a good look at the outside as the C8 passed, his angle gives the smallest of glimpses inside as well. The dash is fully covered, but there’s absolutely no missing the C8’s square-ish, flat-top steering wheel. We’ve never had a good look inside the car, but C8 interior renderings based on alleged leaked designs do feature such a wheel. As for the outside, the car is still wearing plenty of camouflage. That includes plenty of bulky false panels beneath the wrap to obscure body lines and air ducts, especially around the large side intakes. Fan renderings we’ve seen show smaller scoops, though we suspect some of the odd lines will make it to production. The big question right now is when the car will actually be revealed. A Detroit debut was originally expected, but sources and clues later pointed to an established reveal in April at the New York Auto Show. That was before rumors surfaced about some in-depth electrical issues on the car, which could push the revel later into the spring or even summer. 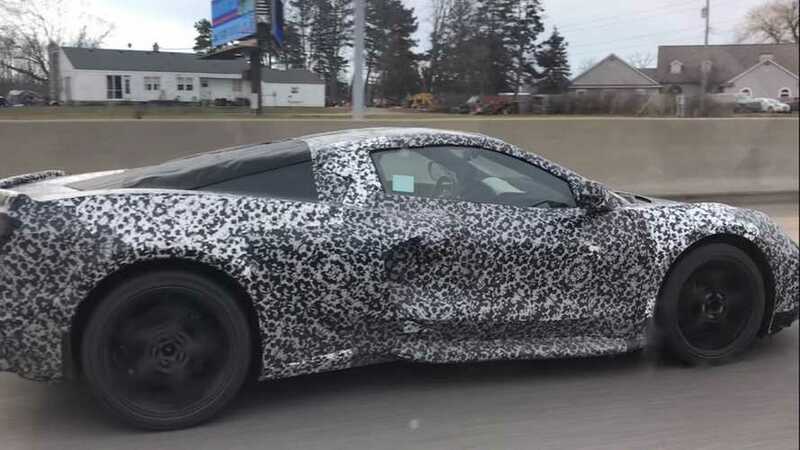 Finally, an alleged insider recently said Detroit would be the location for the C8’s unveiling, claiming his trusted source told him a surprise reveal was coming on January 14. Considering GM has nothing scheduled through the North American International Auto Show for that day, we find the information highly suspect. In the meantime, we’ll keep our eyes peeled in the Detroit area for more mid-engined prototypes.